Edited by Thirteen, 22 November 2015 - 04:38 PM. They are releasing five variants of their cooled series (based on already available uncooled versions with similar specs). 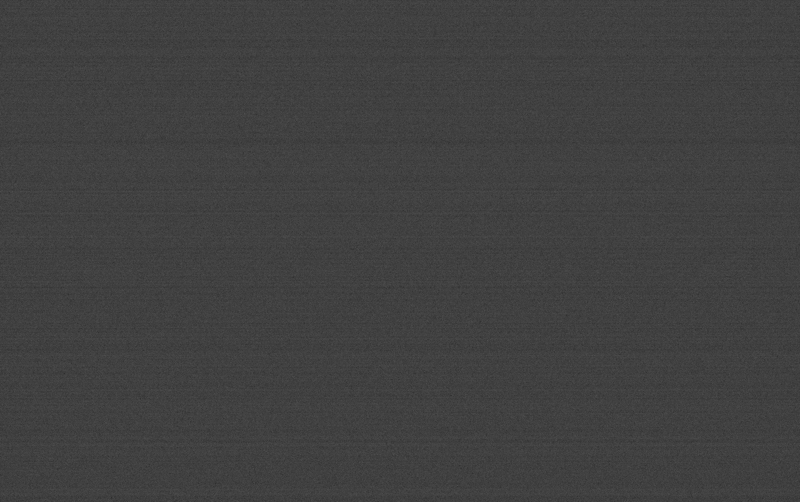 A quick visit to http://astronomy-imaging-camera.com/ will let you sort through those variants. Each carrying one of the latest Sony sensors, these cameras all excel at high speed planetary imaging. Cooling adds an interesting dimension here, though. 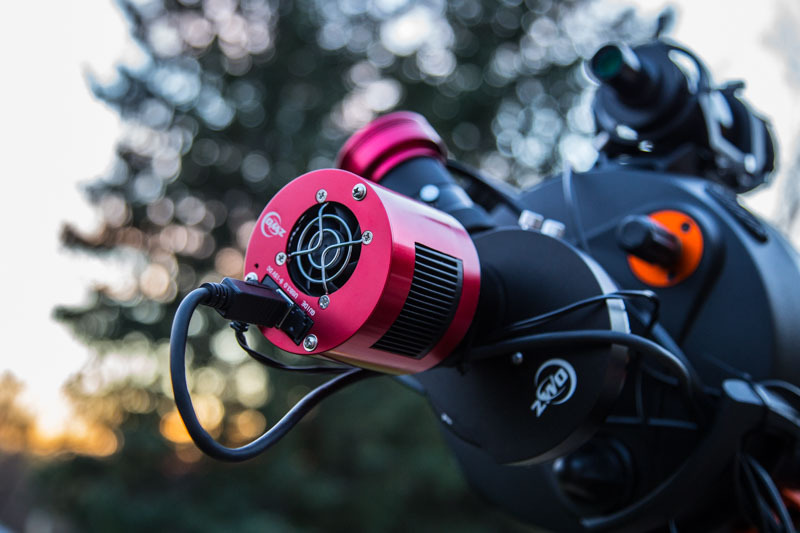 Could these cameras pull double duty as a deep sky imaging camera? Initial tests on uncooled versions showed promise and I was eager to find out. I’m a fan of ZWO cameras and that’s no secret. I have an ASI120MM which was one of ZWO’s first cameras to market. It was excellent for planetary imaging when first released. I had very good success with mine and it also served well as a guide camera through a couple years of deep sky imaging. It was simple, reliable, and reasonably priced. When this latest crop of cameras got released I was ripe for an upgrade, so I started sorting through what would work best for me. 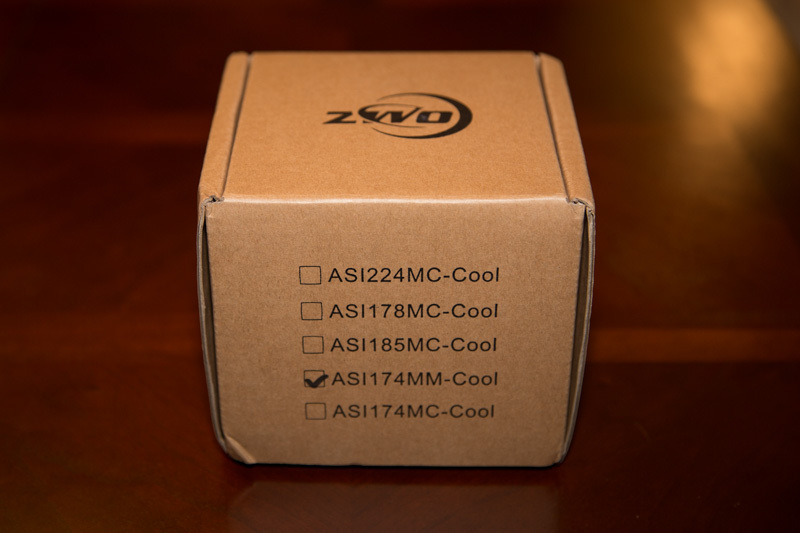 First on the market was the ASI174MM (mono) and ASI174MC (color). 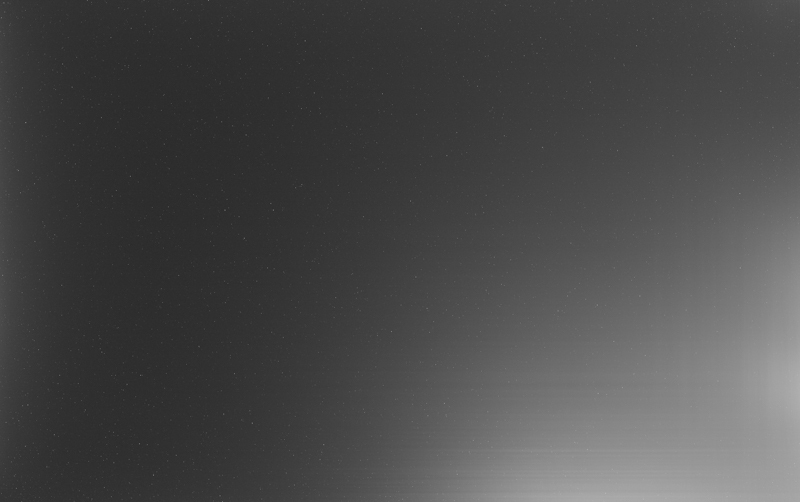 Honestly, I was floored by some of the shots of Saturn I was seeing out of the Planetary Imaging forum. Next came the ASI224MC. It was a one shot color that was rivaling the ASI174MM due to extraordinarily low read noise. Both these cameras were providing capable users with astounding results. But, back to reality. What could I expect out of my modest equipment? Let’s be honest, I wasn’t shooting out of a C14 under stable skies. And, I also want to shoot deep sky (currently I do that with an uncooled DSLR). I’ve long shopped for a CCD, but it’s hard for me to justify considering how much time I currently get for imaging. Plus, I somewhat prefer the jack-of-all-trades idea even if there are compromises. Being able to use a couple hours of clear sky for planetary without a massive equipment changeover is a pretty big plus. 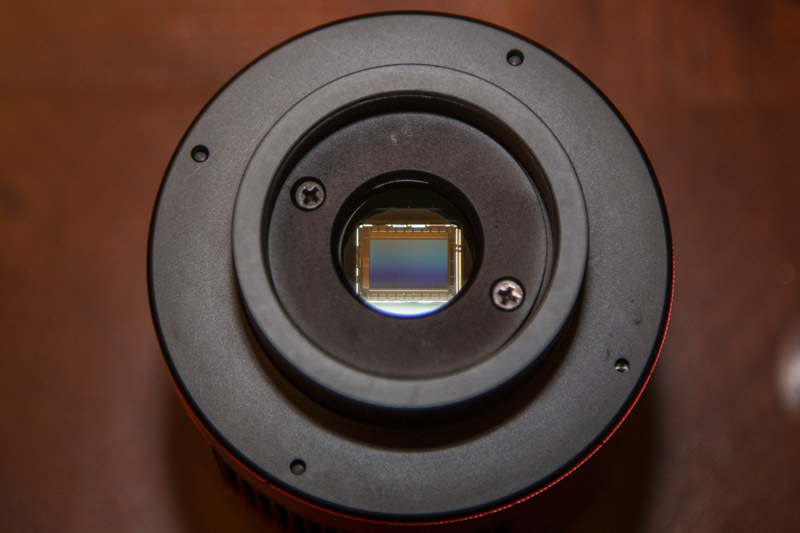 Cooled CMOS sensors are relative newcomers to the amateur astronomy scene and somewhat unproven. But I was willing to give it a go, especially with a camera I know, at the very least, is a top league planetary imager. 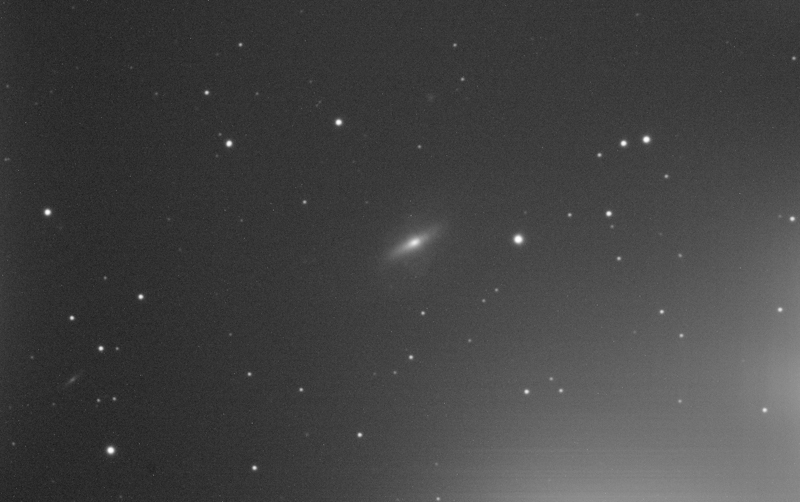 Those who have seen my images over the last few months probably know I shoot at a long focal length and I like galaxies, particularly ones that are less commonly imaged. For me, the decision on which camera to choose was not an easy one. A lot of what you see around for DSO CMOS images are shot with the lucky imaging mindset. Stack thousands frames to reduce noise. With low read noise, this can produce great result when targets are bright. My goal was, though, to see if I could go deep and pull out faint objects. I wanted to use it like a CCD. So, for that I ended up with an ASI174MM. It is the only mono version of the lot with a “larger” sensor and pixel size and more well capacity. A key compromise with any of these sensors is that they are indeed small relative to the APS-C that I was used to. Edited by Thirteen, 22 November 2015 - 04:46 PM. Heard from some very credible sources that the longer term plan certainly from Sony is that everyone will be imaging using cmos and CCD will be a distant memory in 5-10 years. There certainly seems to be some R&D going that way with crops of CMOS options coming along all the time. I was happy to discover that the camera arrived from overseas in 7 days. 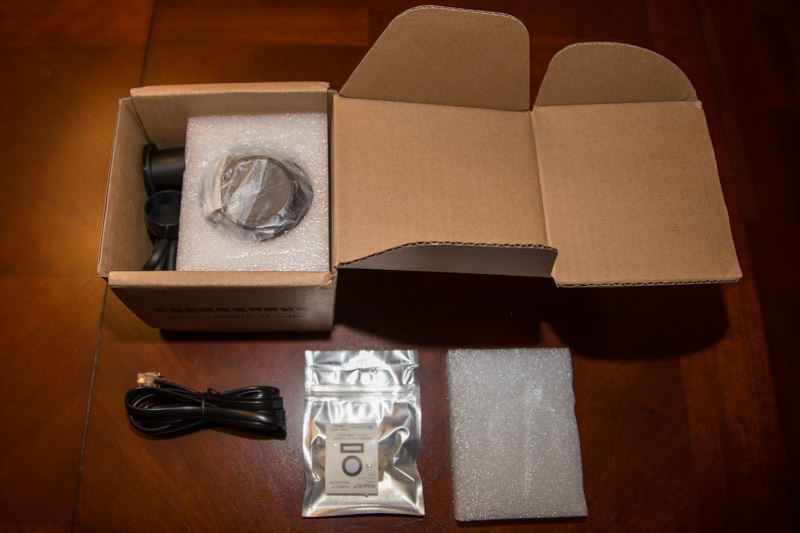 In the box, which will be the retail kit, is the camera with rubber dust cap installed, ST4 cable, USB3.0 cable, desiccant tabs, 1.25” nosepiece, 1.25” nosepiece cap. 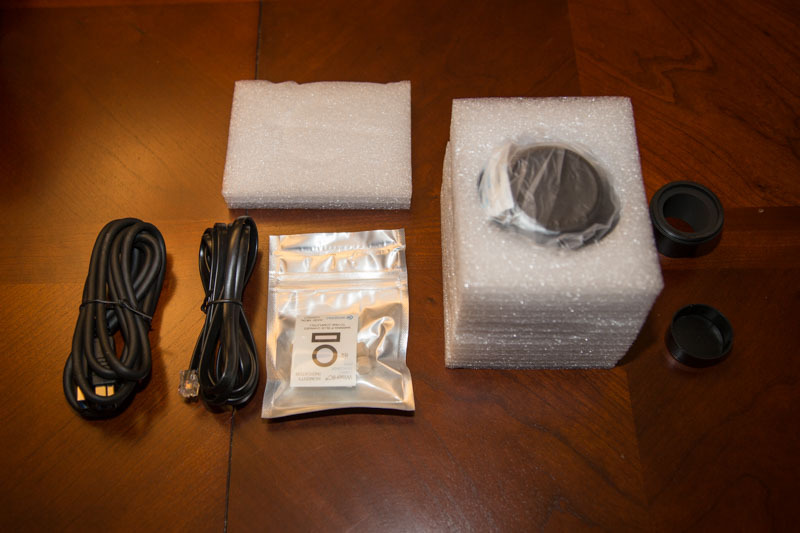 One notable omission is the power supply or any DC adapter. I knew this ahead of time, but it is a required piece to make it work and would have been a nice addition to the kit. Regarding the desiccant tabs, the recommendation there is that they don't need replacing (possibly for years) until frost shows on the sensor. The process is to unscrew the front of the camera and replace a pair of tablets. Seems like I'll cross that bridge when and if I come to it. Edited by Thirteen, 22 November 2015 - 08:20 PM. 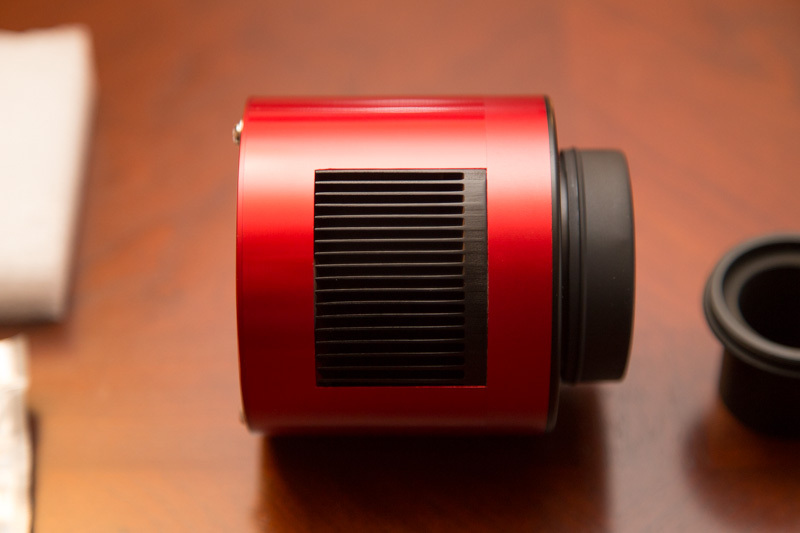 The fan pulls in and exhausts through the heat sink on either side. The heat sink runs the full width of the body. The mono camera comes with an anti-reflection window to seal the sensor and internals from the environment. Everything looked clean and well thought out. The body shape lends itself well to a hyperstar setup at 78mm in diameter. The backfocus spec is 17.5mm which is the same as the non cooled version of this camera. I was a bit concerned with software compatibility because this is a soon to be released camera. I’m happy to report that I had no significant issues here. ZWO recently released updated camera and ASCOM drivers. I initially didn’t realize that they were independent and had some compatibility issue before I installed the ASCOM driver. This was only a problem because I had a previous ASCOM driver installed. A new user would have probably skipped right through this. Once these were updated, though. I was good to go. Installing the ZWO camera drivers places an AMCap shortcut in your start menu. In AMCap you can view your camera output for the first time. This process is as simple as plugging in the USB3.0 cable to the computer and camera and clicking this shortcut. It is from here that I could test out the camera controls. Under Options --> Video Capture Filter… you are presented with this dialog box. In this box, you have access to control the typical camera settings that a previous generation ASI camera user would be familiar with (and should be pretty intuitive for any beginner). “USB Traffic” may be the exception unless you are an ASI camera user. 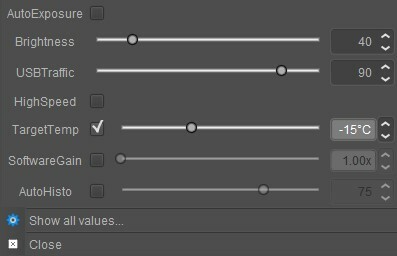 Adjusting this setting can prevent stuttering and framerate issues. Based on my experience with the ASI120MM, I just set this to 90% and it works fine. Here you have access to the setpoint cooling. 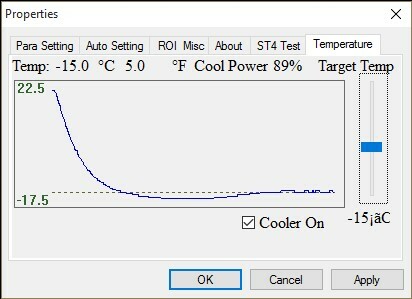 ZWO is claiming this two-stage TEC cooler can reach 35-40C below ambient and my tests show this is entirely possible IF your power supply is appropriate. I tried initially with a 12V 1.5A supply and I maxed it out. I’ll spare the details. The recommended power supply is 12V at a minimum of 2A, but I think having headroom to 3A is a dollar or two well spent. With the cooler at 100% and a 3.0A power supply, we get the 40C delta. It couldn’t quite get to the -42.5C delta I had originally set. Here I backed it off to -15C setpoint and the cooler comfortably stabilizes. All of this is with the camera running in video mode at room temperature to start. I didn’t want to deviate too much from what I had been doing previously for capture software. I use Firecapture for planetary imaging and Sequence Generator Pro for deep sky. That’s about it though, if you’ve used Firecapture before there is literally nothing new here. I mean that in the best way, it just works. So everything, including control of the cooler, works here too. I love it when a plan comes together. The only gotcha here, is that I use a second ASI camera as a guider. Just be sure if you use PHD2 like I do, that you connect to the right guide cam. For some reason it always wanted to go to the ASI174MM as a default. I took a couple snaps just to confirm everything was working (which is when I hit the ASCOM driver snag). But once that was resolved it worked like any other camera I’ve used in SGP. Edited by Thirteen, 23 November 2015 - 12:30 AM. 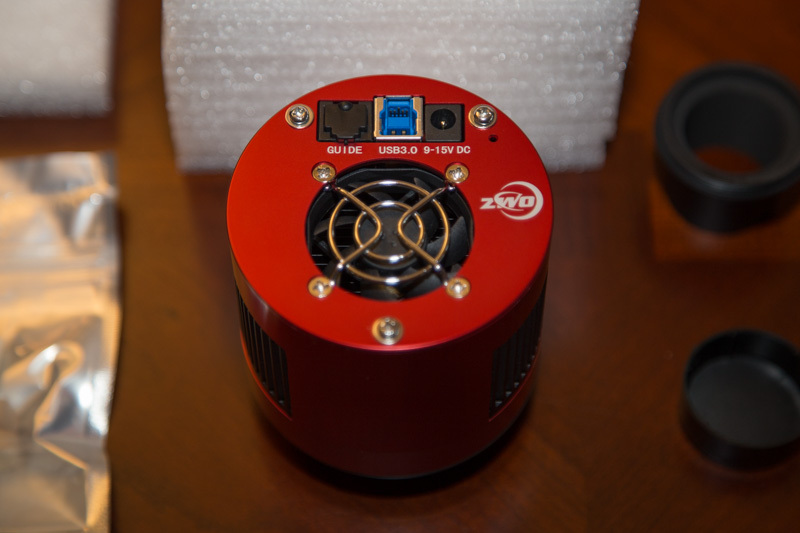 I am also waiting for my cooled 174mm to arrive and will be out imaging next new Moon so cannot wait. Look forward to seeing the results with your set-up particularly when it comes to Gain / Exposure settings vs Frames and Noise. Right off the bat, I needed to check out these dark frames. Here’s an single uncooled (room temperature) 300s dark frame with an STF applied. I added the stats below because without them, all of these appear black. Well, yes, there is a gradient. 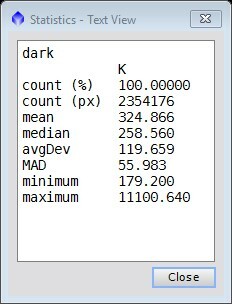 The cooler cuts the mean pixel value roughly in half but leaves the bulk appearance. And a master bias of 200 frames looks like this…. Image statistics show that the variation and banding still seen here is pretty small. This looks like it will be swallowed up by the thermal signal at -15C, but not sure yet if it will be an issue if I drive the temp down when I can. I think this would only matter long term for me if I were to go narrowband with this camera. I think in that scenario the amp glow gradient would still be a bigger issue than this bias signal. This is awesome! 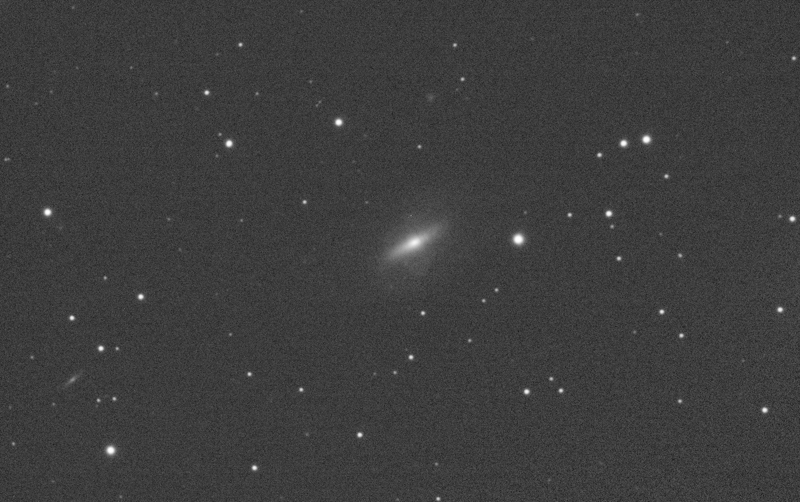 I have been seeing some imaging results with the 174 mono in the ccd imaging section and been jaw dropped with the results of uncooled images. I am even more interested in the cooled 174! Any news of the price point? The camera looks very clean and designed well. The banding is easily removed with Topaz Noise Reduction which has a vertical and horizontal noise banding removal tool. 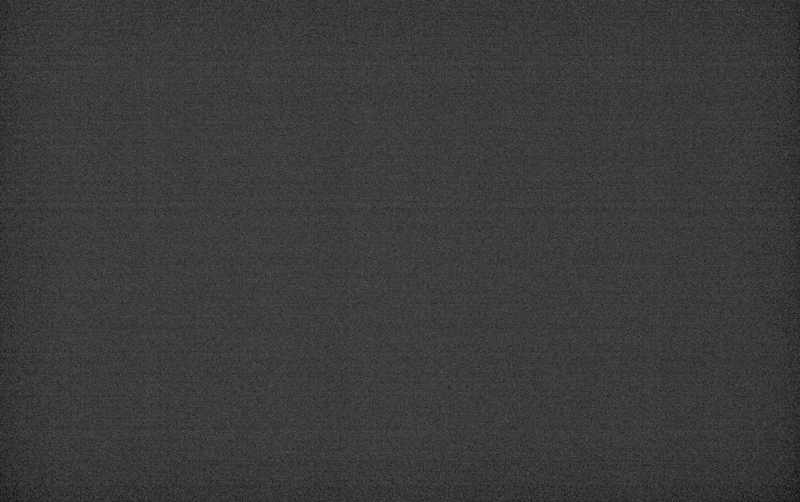 Did you notice any icing or moisture on the CCd camera window? And was it -15 degrees below 0 or below ambient? coinboy1, I think the pricing will be released shortly. John, the banding is ending up not being an issue for me. 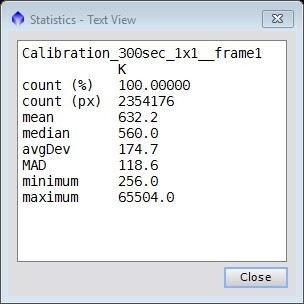 Even in the single bias frame the standard deviation of the ADU is around 4. Since the banding moves frame to frame, one you start stacking (especially with pixel rejection) it really washes out of the data quickly. 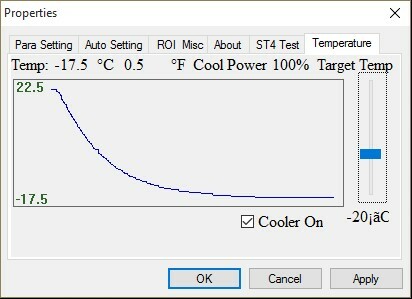 Regarding the cooler, it was set to -15C. 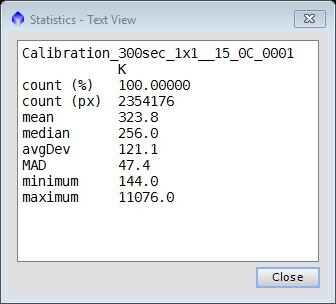 This was the maximum I could go from room temperature from my testing (~40C delta). I haven't noticed any frosting yet. The IMX174 sensor is 11.34x7.13mm, which on my Edge HD 8” @ f/10 gives only a 19.19' x 12.06' FOV and .595 arcsec/px. This is some pretty tight framing for living in a land of mediocre seeing. I have the .7x reducer for the Edge and plan to use it, but for my first evaluation I couldn’t get the OAG and camera spacing right in a timely fashion, so I stuck with f/10. 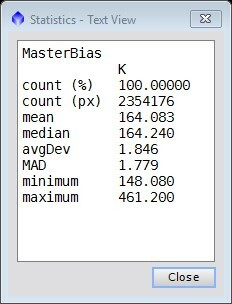 The reducer will put me at a more respectable .85 arcsec/px and obviously increase my FOV. From my planetary imaging I had a manual filter wheel and filters (also ZWO brand). For my first go at it, I’m just going to be working in LRGB. Here is the rig off the back of the scope. 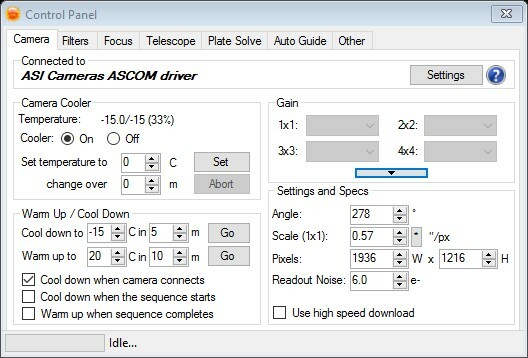 Inside the SGP camera settings there is a dialog box that offers a couple default gain settings for the camera. I chose the Low Gain setting here to give the maximum possible dynamic range. At this setting with my f/10 scope the skyfog mountain was barely breaking free from the left hand side with 5 minutes of exposure but at the same time I was clipping the brightest star. My choice at 5 minutes was a little arbitrary but mostly driven by limited sky time and the want to stack as many exposures as possible. I premade the a dark library at this exposure. Outside I could have run the camera much cooler but to match my darks I just kept it at -15C. In the future I will experiment plenty here, but we are just keeping it simple. For a target, I wanted to choose something that framed nicely at this FOV. For better or worse I found this little, interesting galaxy was positioned well. NGC2685, commonly the Helix Galaxy is a very curious object. 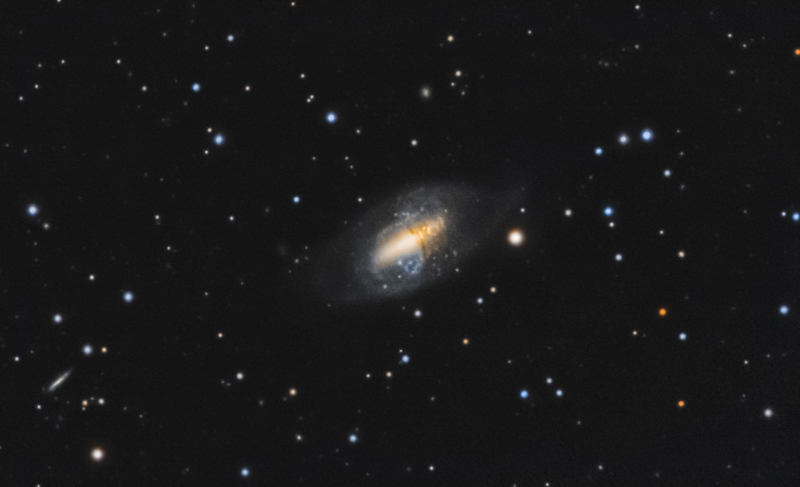 It's one of the rare polar ring galaxies, likely an old galacitic merger. Edited by Thirteen, 24 November 2015 - 01:08 AM. ...and 8 hours later, tada! Edited by Thirteen, 24 November 2015 - 01:07 AM. Wow! I'm quite impressed! Very nice Jason! Thanks Richard! As I said over in the Astrobin link, I think it's an excellent starting point for the camera. Putting this small a chip behind an SCT at f/10 is pretty unforgiving. And I'm staring at an annotated version here and its pretty impressive. This field is littered with galaxies. PI identified 492 galaxies in this frame down to 21 magnitude and I can pick many of them in the 20-21 range out in this shot. Edited by Thirteen, 24 November 2015 - 01:43 AM. That's a great first light Jason on a faint object as well with a slow optical system so you should be very happy with that! Wow wow wow!!! Utterly amazed at the performance!! I want this camera !! That goes really deep. What is the QE of the camera and how dark are your skies? Great shot of the galaxy!! Super awesome!!! This is fantastic Jason. Thanks for the detailed write up. I'm very interested to see how it does with planetary imaging as well. This is really interesting. It looks like this camera might fit on the buisness end of Hyperstar as well.